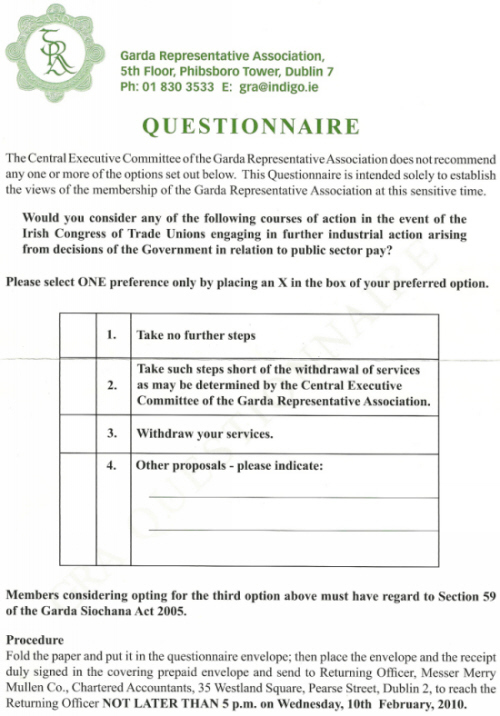 From February 2010 a Questionnaire from the Garda Representative Association to members. Note how it is not called a Ballot (Is that because it’s not a Union?). The Section 59 of the Garda Siochana Act 2005 refered to states that a person is guilty of an offence if he or she induces, or does any act calculated to induce, any member of the Garda Siochana to withhold his or her services or to commit a breach of discipline. There is also a receipt to be signed of the questionnaire and that was to be put in an envelope and the lot sent off to an accountants office.